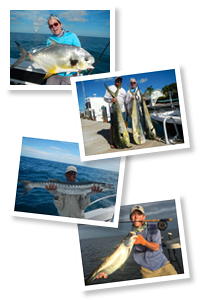 Big Pine Key fishing charters in the crystal clear waters of the Florida Keys, with a professional and patient guide who takes Florida Keys fishing to a whole new level of enjoyment. Whatever your fishing preferences, Big Pine Key fishing offers both offshore fishing for Marlin, Sailfish, Tuna, Wahoo, Dolphin (Mahi-Mahi), Grouper, or Kingfish, as well as inshore fishing on the Gulf side of the Keys. There is great flats fishing action in the calm inshore (backcountry) waters on the Gulf of Mexico side of Big Pine Key. Here you'll be fishing for a wide variety of fish including, Tarpon fishing, Bonefish, Permit, Sea Trout, Grouper, Mackerel, Cobia, Jack Crevalle, Barracuda and Sharks. From novice to expert Capt. Jim will arrange a trip custom tailored for you. Having devoted the majority of his life to Florida Keys fishing Jim has a thorough knowledge of the Florida Keys waters, both Atlantic and Gulf side. "To me being a charter Captain is more of a lifesyle than a business. I've always enjoyed being on the water and fishing, and there is nothing I'd rather do. 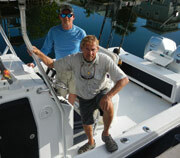 Being able to share the fantastic fishing we have here in the Keys with my customers is very rewarding." Jim has been fishing Big Pine Key and the surrounding waters of the Florida Keys for more than 35 years now. He holds a United States Coast Guard 50 Ton Masters License, and is a fully insured commercial fishing guide.